Anyone exploring Hadrian's Wall will become very familiar with the roads later built close to or, in some cases, directly along its line. 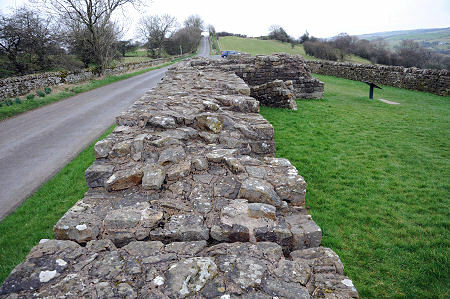 Slightly south west of Gilsland, a minor road follows the line of the wall from Birdoswald Fort to the tiny hamlet of Banks. En route it passes the remains of several turrets, the most easterly of which is Banks East Turret, or Turret 52a. There's a good sized car park just to the east of the length of surviving wall, perhaps 100m of it, which flanks Banks East Turret. The wall is fairly low at its outer ends, but rises to a maximum height of 1.75m where it abuts the turret itself. When the western 30 miles of Hadrian's Wall from Willowford to its terminus at Bowness on Solway was originally constructed in the 120s it was made of turf. 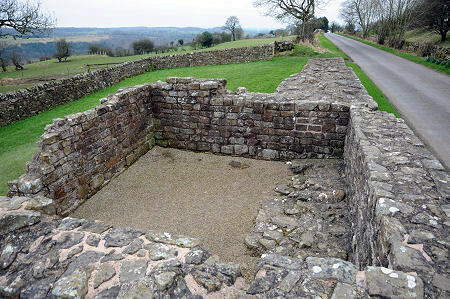 The milecastles on this part of the wall were also made from turf, though the turrets were constructed from stone. The turf sections of the wall were later replaced in stone, probably within 10 years, and Banks East Turret is particularly interesting because it was originally designed to be flanked by turf walls. The section of the wall at Banks East is also of note, rather sadly, because it is the most westerly of the significant remains still visible above ground. There is a small chunk still standing a mile to the west at Hare Hill, but otherwise nothing of the wall remains above ground from here to Bowness on Solway, well over 20 miles to the west, and nearer to 30 by the route it actually follows. One of the oddities of the siting of this length of the wall is that it runs along the rear shoulder of higher ground which rises to its north. You'd think that if the assumed purpose of the wall was to confront enemies found largely to the north (which was probably only one of its roles) then it is in the wrong place. The turret here offers magnificent views over the (presumably more friendly) land to the south, while any enemy approaching from the north is concealed by higher ground until quite close to the wall itself. A path leading east from the car park takes you the 170m to a second Roman site, Pike Hill Signal Tower. This was one of a number of such towers built on high ground to the north of the line of the Roman road known as the Stanegate and its accompanying forts. These predated the building of Hadrian's Wall, and this helps explain why the stone walls you can see here today are turned at an angle of 45 degrees to the line of the wall. The line later chosen for Hadrian's Wall passed across Pike Hill, and the existing signal station was simply incorporated into the wall. The original structure was probably at least as extensive as the remains you can see today at Banks East Turret, but when the road was built in the 1800s it went right through the summit of the hill, wiping out all but the stray corner of the tower you can see today.